Last week the California High Speed Rail Authority Board approved the Revised Business Plan. Even with a 33% cost reduction it still provides high speed service service to most of California, while also making significant improvements to commuter rail infrastructure and service in the Bay Area and the LA Metro region. The project will essentially be built in stages rather than one fell swoop. 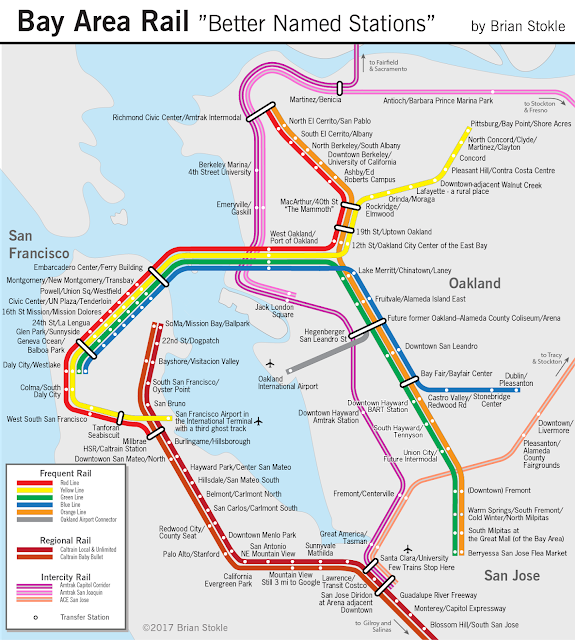 We, here at Urban Life Signs, never imagined the system would be built all at once, even the San Francisco-Los Angeles segment. The interstate highway was built in stages, and is a great piece of infrastructure that we all use and can hardly imagine surviving without it. Likewise, the high speed rail system will be built in stages, and become so normal and unsexy, yet relied upon, that we won't be able to imagine surviving without it. In fact, the revised plan points out how the interstate highway system was built out over time, in numerous stages. The California State Water project and other High Speed Rail (HSR) systems are also noted for their construction in stages. Building in stages allows financing of the project to be spread out over time, along with starting service much sooner than if built all at once or in two big stages. Less noticed, building in stages allows for adaptation as the state's economy, population, culture and environment inevitably change over the next 50 years. The decision to move ahead with the initial step does not commit the state to proceeding with the full program as outlined in this Revised Plan. By providing decision-makers with the flexibility to change course or timing, the plan preserves flexibility and can adapt to changing economic and budgetary realities or new opportunities. This approach is consistent with how other major infrastructure programs are implemented. The Interstate Highway System was designated in whole at the outset but constructed in phases over more than 50 years based on availability of funds, economic conditions, and other factors. The same has been true with the California freeway system and the state water project. HSR systems in other countries have been delivered this way as well. In Japan, for instance, initial plans provided an outline for full development, but implementation took place in segments, sometimes with years between the completion of one segment and the initiation of the next. The new approach calls for a "Blended Approach", which means "integration of high-speed trains with existing intercity and commuter/regional rail systems via coordinating" infrastructure and operations. Both the rail tracks and the operations are blended to create an efficient and higher speed system that is much faster than current "slow" rail, but not as expensive as a "stand-alone" full high-speed system. 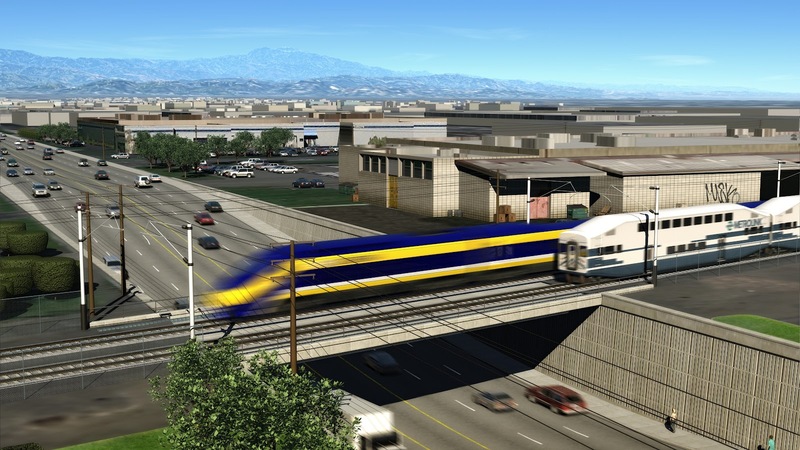 HSR tracks will be built from Merced to Bakerfield and on to Palmdale over Tehachapi Pass. Existing rail like Stockton to Bay Area and LA to Anaheim will get improvements like electrification and grade separations (bridges separating tracks and streets) but tracks will not be converted to full high speed. Instead they will likely support enhanced speeds between 75 and 90 miles per hour. The critical part is the third bullet point. Does this mean that high speed trains will only run on high speed tracks, or will high speed trains also run on standard tracks at normal speeds (e.g. 80-90 mph)? Urban Life Signs supports the second model. In this case, if high speed tracks are laid from Bakersfield to Merced, while standard tracks with improvements, like electrification and grade separations, are used from Merced to Oakland, via Stockton, you could take a sleek high speed train from Bakersfield to Oakland. The High Speed Train vehicle would run on BOTH the high and low speed tracks and accordingly slow down on the standard tracks from its 200 mph speed down to 90 mph. This has been done for decades in France and in other parts of the world, and provides great travel time reductions, even if the journey only uses high speed tracks 1/2 the distance. The new operating plan will use $950 million of Prop 1A toward improved service at the "bookends" i.e. Los Angeles and the Bay Area. These improvements will tie to the eventual HSR service. Effectively this means benefits to Caltrain and Metrolink that will provide benefits to commuters in the near-term and "pave the way for the future HSR system." But, let's step back for a moment. Did the California High Speed Rail select the right first stage to add onto the Merced-Bakersfield "spine"? Could there be a route that would serve more people, cost less to build, and offer better travel times, but may have been less politically palatable. The CAHSR says that they chose the Merced - Palmdale segment because it links California's largest population region with its fastest growing region. Although those two facts may be true, and it has a nice ring to it, the route may not be the best. In this post we'll study three options and the infrastructure required. Cost and politics will be considered, but seeing as we are not economists, engineers, or politicians, we'll stick to what's easily available, and what we're good at: transportation planning. In Part 2, we'll compare travel times for the three options, and existing travel by plane, car, and bus. Below is a map showing the revised business plan, which we'll call the Tehachapi Palmdale route. The other two routes we'll study are the San Joaquin Stockton route, and the Pacheco Gilroy route. In the Tehachapi Palmdale route, the HSR tracks will first be built from Merced to Bakersfield, but soon after, extended to Palmdale in Antelope Valley. 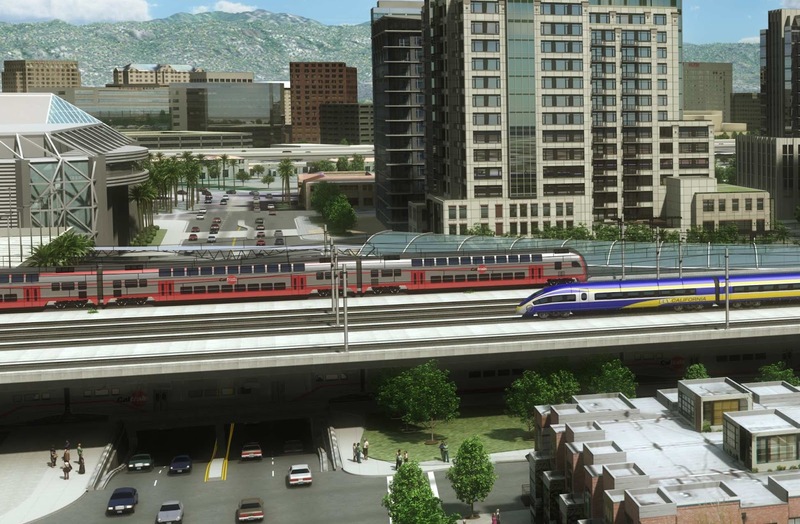 Current Metrolink rail service runs from LA's Union Station up to Palmdale so passengers could either transfer, or if improvements are made, the high speed train vehicles could continue from Palmdale to Los Angeles and Anaheim, at slower speeds. Combined with the improvements from the Northern California Unified Service (NCUS), a passenger could have a one-seat ride from San Francisco to LA, or from Sacramento to Anaheim. The physical advantages to this route, which the CAHSR revised Business Plan highlight, is that the "rail gap" between Bakersfield and the LA Basin is bridged. Currently Amtrak passengers passing from Bakersfield to Los Angeles must take an Amtrak bus; i.e. today, a train ride from Fresno to LA is not a one seat ride. It's a two seat ride: one on a train and then on a bus seat. The downside to this is that building the tracks through the Tehachapi Mountains will prove difficult and expensive, with many tunnels, and bridges. Under this option (not recommended by the CAHSR), HSR tracks would extend from the spine from Merced to Gilroy. 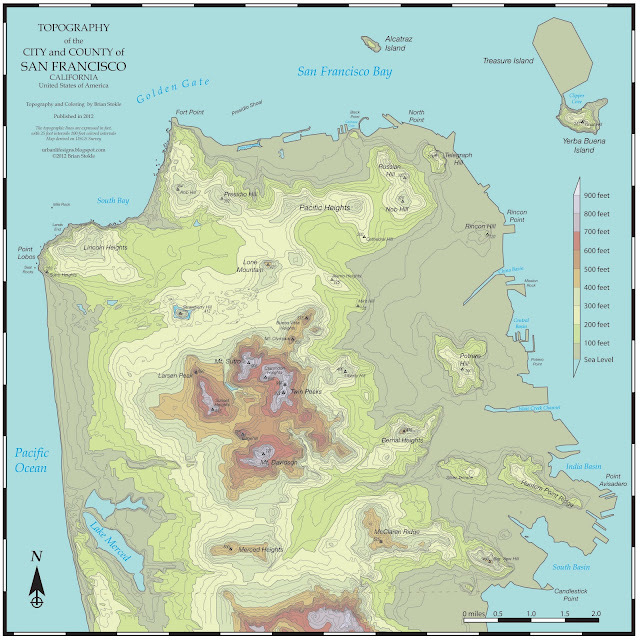 Under these conditions, the advantages would benefit Northern California more than Southern California. 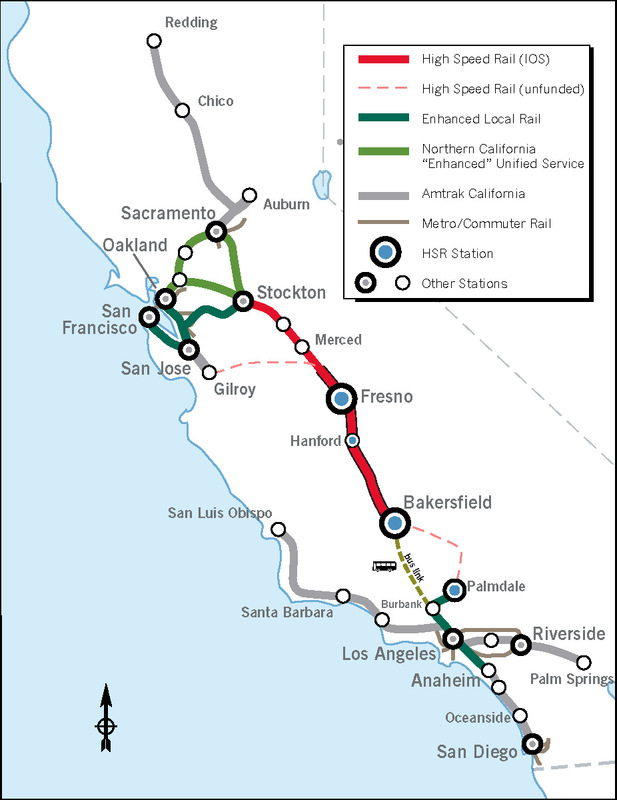 Like the Tehachapi Palmdale option, building HSR tracks through the Coast Range at Pacheco Pass would be expensive and challenging with many tunnels and bridges. In addition, and more importantly, the bus link between Bakersfield and Los Angeles would not be "bridged". Passengers traveling from San Jose to Los Angeles would have a 2 seat ride rather than a 1 seat ride, and require transferring from the train to a bus in Bakersfield. Here, HSR tracks would extend north of the spine from Merced to Stockton. The cost of building this segment would be dramatically cheaper than the Tehachapi and Pacheco options due to the flat route that mostly passes through farmland. Similar to the Pacheco option, the advantages would benefit Northern California more than Southern California. Likewise, the bus link between Bakersfield and Los Angeles would still not be "bridged". Passengers traveling from Sacramento to Los Angeles would have a 2 seat ride rather than a 1 seat ride, and require transferring from the train to a bus in Bakersfield. In Part 2, we'll study these three options, and their travel times in more detail.